If you’ve ever visited the world famous stone circles of Stonehenge or Avebury, you will know how incredibly popular they are with tourists. You will also quickly realise that bustling crowds of visitors are not particularly conducive to an atmosphere of magic at these ancient sites. 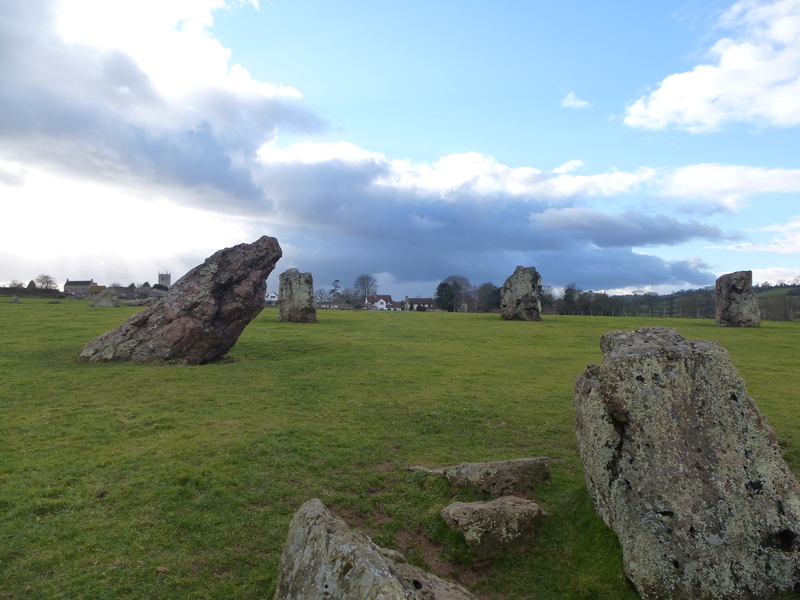 On a recent visit to Somerset, I discovered the stones of Stanton Drew, which despite lying only a few miles away from those more famous circles, seem rather overlooked. As a result, these marvellous megaliths retain a strangely magical atmosphere. 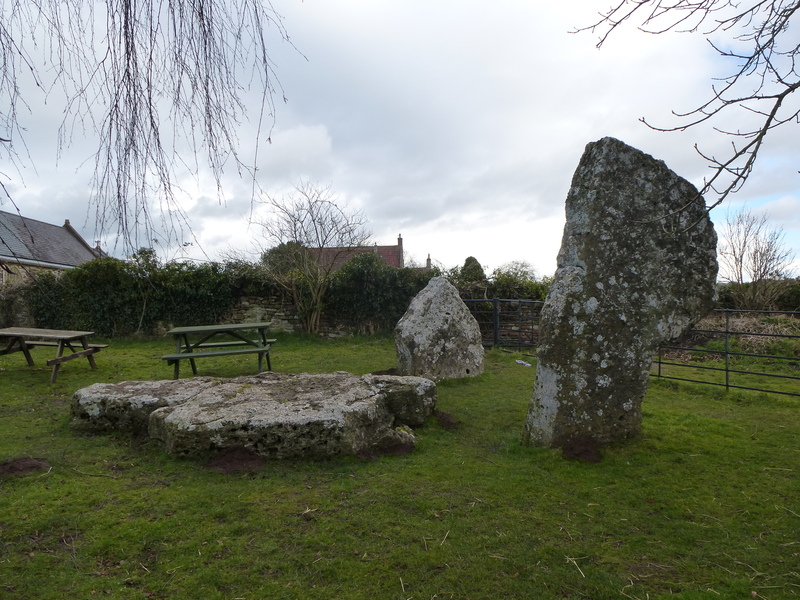 There are in fact three stone circles in the fields around the village of Stanton Drew, as well as a group of three huge stones known as ‘The Cove’ in a pub garden next to the church. Recent geophysical surveys have uncovered evidence that the surviving stones are just part of a huge ritual site which is believed to be between four and five thousand years old. 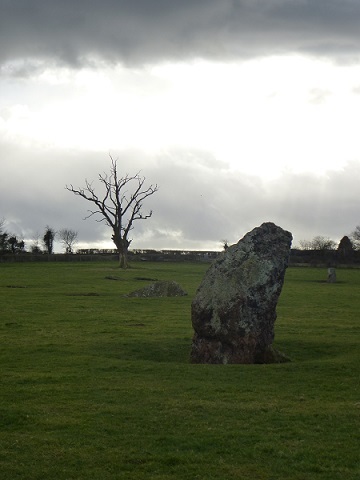 Today, although much of it has disappeared or lies hidden below the earth, Stanton Drew is recognised as the third largest collection of standing stones in England. On the day that I visited, the dramatic sky definitely added to the magical character of Stanton Drew. It is impossible to get a sense of the scale of these circles from a photograph, as they stretch across a huge area, disappearing into dips and over a ridge. 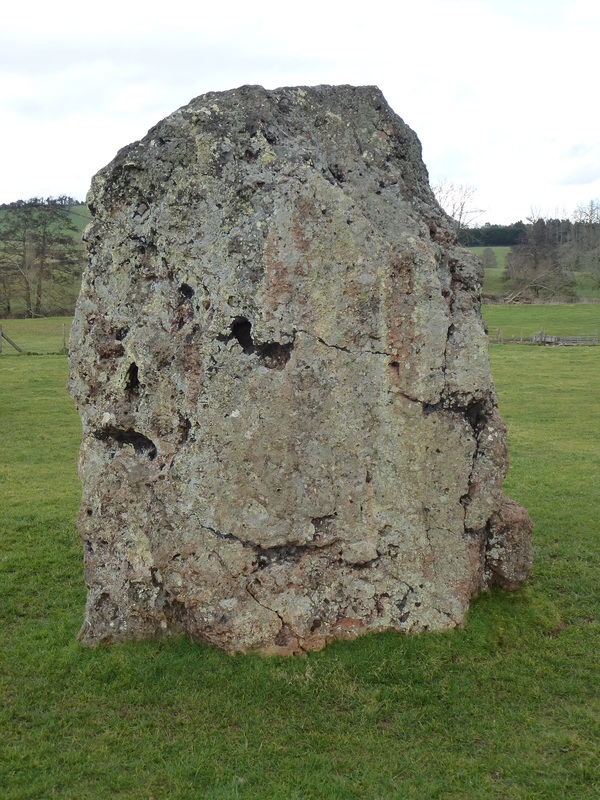 Some of the stones are huge, massive lumps of licheny rock which cast long, dark shadows. Many have tumbled over and now lie pitted and mossy on the ground. Like many ancient sites, Stanton Drew’s impressive stones have some interesting myths and legends attached to them. For centuries they were attributed to King Arthur, who was supposed to have set up the stones to commemorate a military victory, a story no doubt inspired by similar links made between the nearby village of Camerley and Arthur’s celebrated Camelot. Another myth tells that the circles are the remains of guests at a wedding party who unwisely decided to celebrate with dancing on a Sunday. Their punishment for breaking the sabbath was to be turned to stone, inspiring the site’s local nickname of “the fiddlers and the maids”. This entry was posted on March 2, 2015 at 6:29 pm and is filed under History, Legend, Somerset, Standing Stones with tags Avebury, Camelot, King Arthur, Somerset, standing stones, Stanton Drew, Stonehenge. You can follow any responses to this entry through the RSS 2.0 feed. You can leave a response, or trackback from your own site. What a fabulous sight. I love how some of the stones now reside in a pub garden! It is a wonderful spot. And the huge stones did look slightly out of place next to the pub tables…but still very impressive! One reason I liked Callanish was that it was not so crowded. I’ve passed this on to a friend who’s much into prehistoric Britain. I agree, having a place like this to yourself makes such a difference – it allows you to let you imagination run wild. I hadn’t heard of these before, but think I would prefer their peace to the crowds of Stonehenge. Definitely – we drove past Stonehenge the same weekend, there was a traffic jam on the road and crowds at the stones. Not very magical! The third largest collection of standing stones in England? And I’d never heard of it until now. Amazing! I know, they really are an undiscovered gem. Although we don’t want too many people to find out about them of course…! wonderful post- I felt the same way on Machrie Moor – I was alone there for quite a while- it was powerful! Thanks, glad you enjoyed it. I don’t know Machrie Moor but have just googled it – it looks amazing! It really is a special place – highly recommended!